Shannon Strombom (3L) has been chosen as the winner of the State Bar of Wisconsin’s Outstanding Public Interest Law Student of the Year. The criteria used to determine a winner of this award includes a demonstrated commitment to working in the public interest, public interest involvement before and during law school, exceptional volunteer work or activism in the community, and a commitment to helping others. Strombom came to law school with a mission to help others, and she wasted no time getting involved. 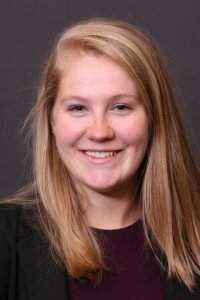 She started doing pro bono work in her first weeks as a 1L and has performed nearly 250 pro bono hours in seven different pro bono projects including the Marquette Volunteer Legal Clinics, Milwaukee Justice Center, Eviction Defense Project, Guardianship Clinic, Domestic Violence Project, U-Visa Project, and Youth Law Day. In other words, if a pro bono project is offered to students, Strombom signs up to do it. Strombom is also the two-time recipient of a Public Interest Law Society fellowship. She has focused her fellowship work on immigration law, working one summer with Catholic Charities Legal Services for Immigrants and the next summer in the Arlington, Virginia, Immigration Court. As for her plans after graduation, Strombom plans to build upon past experience and practice immigration law in a government, non-profit or small firm setting. Strombom particularly hopes to focus on family-based immigration law or humanitarian immigration law, such as asylum. Strombom is an inspiration to us all. We are proud she will soon be a Marquette Lawyer. Congratulations, Shannon! What a wonderful accomplishment and well-deserved award.